Dimming the sun to minimise the effects of global warming, as some have proposed, may bring on drought, scientists say. They are commenting on proposals to emulating the sun-dimming effects of large volcanic eruptions to slow the earth's greenhouse effect. 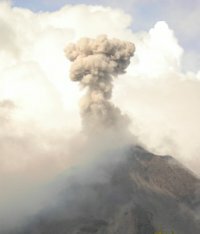 Their study of the 1991 Mount Pinatubo eruption in the Philippines shows that the far-flung effects of its sun-blocking particles led to a marked decrease in precipitation worldwide. An attempt to mimic volcanoes to cool the earth by blocking solar energy reaching the planet's surface could have similar short-term effects, they say, which could be worse than global warming. "They're all designed to cut the incoming [solar] radiation," says climate researcher Dr Kevin Trenberth, referring to various proposals to geoengineer our way out of global warming. But he says you can't engineer the climate without thinking about the entire flow of that incoming heat. That heat flow warms tropical oceans, which evaporates lots of water. The water vapour moves to higher latitudes, where it rains down and releases heat that can radiate back into space. "So if you are changing this flow of energy, it's going to have an impact," says Trenberth, who works at the US National Center for Atmospheric Research. The immediate effect is less rain falling worldwide, or drought. Trenberth and his colleague Dr Aiguo Dai found just such a pronounced drop in precipitation, seen in terms of the world's stream and river flows, after the 1991 eruption. There was a "singular decrease" in river discharges into the oceans, says Trenberth, whose work is published in the journal Geophysical Research Letters. Unlike the more gradual effects of global warming, experience shows that droughts can cause famine immediately, along with political and economic instability. "There is really a major ethical aspect to it," says Trenberth. "If you can really [dim solar radiation], who is in charge? Who plays God?" After all, he says, it's one thing to accidentally cause the climate to change, as has happened with global warming, and another to deliberately tinker with it. Dr Robert Adler, a climate researcher from NASA's Goddard Space Flight Center, agrees. "Any time you are talking about geoengineering you have to be very careful," he says. "If you don't understand the system, and we do not fully understand this system, you can get perturbations." Another problem with mimicking volcanoes is that you have to keep doing it or face potential trouble when the effect wears off in 18 months or so and the climate rebounds, says Trenberth.